what is myself of illusion? “Past” event which has already passed away is known. “Future” event which has not yet come is unknown. “Present” event which is really being is whether known or unknown? This is neither known nor unknown but only one substantial. Known is not only one as well as unknown is not only one but substantial is only one. What is the only substantial one? This is entirely the death. What is to live is nothing but just an absent concept of death. We have lived a life in getting rid of death. 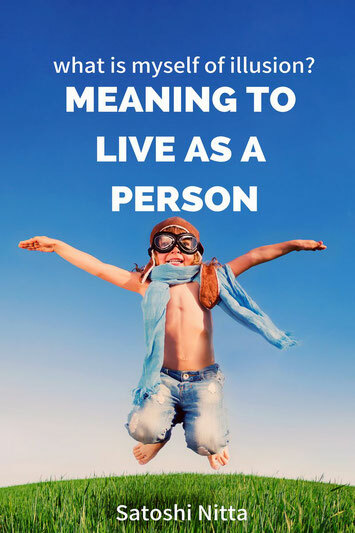 Who can answer to the question what is to live? Let’s go over what to live is one by one. We human adults are waking up in the morning after dream in the night sleep every night but the human naïve children are waking up in the morning immediately after falling into sleep previous night. We human adults and human children have completely different sleeping system. How come have we human adults become completely different from the children? We human children have sleeping system with only fast asleep but we human adults have with not only fast asleep but dreaming sleep. Why do not we human children have sleeping system with dream? It is not necessary to have dreaming sleep for the one who is naïve and necessary for the one who is not naïve. It is not necessary to have dreaming sleep if he is naïve. It is necessary to have dreaming sleep if he is not naïve. What does the fact mean? To dream is nothing but necessary evil. To dream is essentially unnecessary. To dream is nothing but the story about Adam and Eve who had been expelled from the Garden of Eden. This is our human adults who have been starting their misunderstanding life every morning. This is entirely the real meaning of our human adult life which is starting from misunderstanding. To be aware of this authentic fact is the first factor to be understood about real meaning of life. How have our dreams which had been recognized every morning start every night? We can remember the end of dream when we wake up in every morning but not remember when the dream started. What is the reason for that we must remember the beginning of dream for we can remember the end of dream? We have remembered the end of dream every morning but not the beginning of dream. We think maybe we have all events with end but not beginning. This is entirely the reason why I insist there maybe not the Big-bang for the beginning of our universe. We must have remembered the beginning of dream because we can remember the end of dream every morning. Was there not the Big-bang because we don’t remember the beginning of dream? If everything in the universe has the beginning and the ending then there was not the Big-bang then why do we not remember the beginning of dream? If everything in the universe has the ending but not the beginning then there was not the Big-bang because we don’t remember the beginning of dream? If everything in the universe has neither the ending but nor the beginning then dream which we have found as the ending of dream has not been ending? There should be the truth among above possibilities. The key to get answer to the question what to live is nothing but to get the answer to the question what the meaning of beginning and ending is, isn’t it? What to live is nothing but to get the answer to the question what the meaning of beginning and ending is. All the creations in the natural society and our naive human children have lived a life in the world without the ending. It is because they don’t know about death which is the end of life. This is entirely the live drama which is unknown about conclusion of drama. We human adults have lived a life in the world with the ending. It is because we know about death which is the end of life. This is entirely the recoded drama which is known about conclusion of drama. Which society is not right? The natural society and we human children’s society are right and only we human society is not right. How come is our human adult society wrong? Was it wrong for us to know about the last death? Mankind of civilized society has never been evolving but degenerating? Mankind is surely going to be exterminated. Why did the Earth give a birth to such mankind? Why did god give a birth to such mankind? This is entirely the raison d'être of the world of dichotomy. This is entirely the raison d'être of the world of dichotomy as necessary evil. Mankind is nothing but necessary evil for the Earth. Mankind is entirely not necessary if the Earth is rotating and revolving according to inevitability. Mankind is necessary because the whole universe from the macro world into the macro world is according to accidental. It is because the whole universe is according to probability. The world without the beginning and the ending is nothing but the world of probability = the world of accidental = the world without god = the world where it is possible for mankind as a necessary evil to exist. There was our human being first of all and our cosmos shall be shall be argued on the premise “A strong anthropic principle” about how our Cosmos is being. There was our cosmos first of all and our human being shall be shall be argued on the premise “A weak anthropic principle” about how our Cosmos is being. The idea that there was the beginning in our cosmos is according to “A strong anthropic principle”. It is the world of inevitability where there was the beginning shot. The one who gave the beginning shot was nothing but the concept of god. It must be Big-crunch, the end of universe if the beginning of universe was Big-bang. The world of inevitability must be given the ending shot for the endless world must not be allowed. The one who is going to give the ending shot must be god. The world with the beginning and the ending must be the world created by god. The one who created the concept of god is nothing but our human beings. Who created our human beings? You cannot say that it is god who created our human beings. We human beings are like weasels being with vicious circle. This is god who created our human beings who created god who created our human beings who・・・・・. The world with the beginning and the ending is nothing but the weasels’ world. There is neither a strong “anthropic principle” nor a weak “anthropic principle” but just “anthropic principle” among which the issue is not “anthropic principle” but which is strong or weak. It is because strong = weak is essence of dichotomy of strong/weak. Which is strong or weak is the idea of antinomy, is not essential for dichotomy. Strong = weak is the idea of complementary, is essential for dichotomy. This is entirely the key to go beyond dichotomy which is the idea of not strong and not weak due to strong = weak if the dichotomy of “a strong anthropic principle” and “a weak anthropic principle” is not antinomy but complementary for “a strong anthropic principle” = “a weak anthropic principle”. The process of monism →dualism →trilism is nothing but the process of the starting point (substantial point) →the circumference (imaginary line) →the ending point (substantial point). The starting point = the ending point is substantial and the circumference between the starting point and the ending point is nothing but imaginary (illusionary) necessary evil. “Anthropic principle” itself is imaginary (illusionary) but it is such necessary evil that we human beings can reach the trilism (the ending point). The raison d'être of human being is nothing but the raison d'être of necessary evil. Mankind built up the civilized society which was from the ancient time →the middle age →the modern times and it reaches now because of power of necessary evil. It was not necessary for all other creations in the natural society on the Earth to have to build up the civilization as a necessary evil because they have been depending on the motherly land of the Earth. The civilization is nothing but necessary evil for the motherly land of the Earth. Is necessary evil absolutely necessary for the motherly land of the Earth? Necessary evil is not necessary essentially but relatively necessary for the motherly land of the Earth. Mankind is conditionally necessary for the motherly land of the Earth. Mankind as necessary evil is necessary so that it can circularly back to unnecessary virtue. The necessary evil is nothing but just an absent concept of unnecessary virtue. The necessary evil and the unnecessary virtue makes dichotomy where the unnecessary virtue is substantial and the necessary evil is just an absent concept of unnecessary virtue. This is entirely the raison d'être of the necessary evil. We human beings must realize that mankind has never been the lord of all creations but just dinosaurs for the Earth. We human society is nothing but the world of dichotomy = the world of necessary evil. Chapter 16 Why “Now” = “Only one”? Chapter 17 Why “Here” = “Absolute”? Chapter 90 What is civilization? Chapter 99 Why do we learn? Chapter 100 What do we learn for? Truth is piles of realities. Reality is piles of facts. Fact is piles of the event at “now & here”. The concept of time such as past/present/future is nothing but the illusionary tool forged by human beings. To reach the truth above mentioned is nothing but the real meaning of what is to live. We human beings have fallen into the syndrome of the tone deaf without awareness at the certain time. Virtue/virtue and evil/evil are each 1.5 % and total 3 % of possibility. Virtue/evil and evil/virtue are each 48.5 % and total 97 % of possibility. Unnecessity is total 3 %. It shall be only total 3 % people who can change our human society. This is the ridiculous proverb in the male-oriented society. This shall be the common sense in the coming equality society.